One of the first things search engine marketing professionals must discuss with a new client is budget: What portion of their marketing dollars is devoted to paid search? It seems like a simple question, but there are a variety of ways in which companies approach this. There are set budgets where clients are only willing to devote a certain amount of spend no matter what the performance looks like. Performance-based budgets allow for flexibility to spend as long as the goals are being met. But often overlooked is the importance of a testing budget: A separate budget to try new things within an account that have not yet been proven successful. 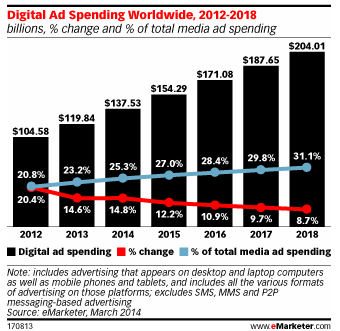 emarketer.com estimates that digital ad spending will be up 12.2 percent in 2015 to $154 billion worldwide (see image below), and it is only expected to grow each year. Along with this, Gartner released a survey that found that 50 percent of companies plan on increasing their marketing budget in 2015, and the average increase to the digital marketing budget will be 17 percent. That’s a pretty good chunk of change. That means more competition and more pressure to be ahead of the game when it comes to testing new ideas. What’s tried and true in each account may not be enough to compete with forward-looking competitors on top of new betas and campaign types. In 2014 alone, Google rolled out over 30 betas across all verticals. Presumably, not all of them were successful for every company that tried them, but there’s no way to know what is tried versus true unless each is tested (and tested again). 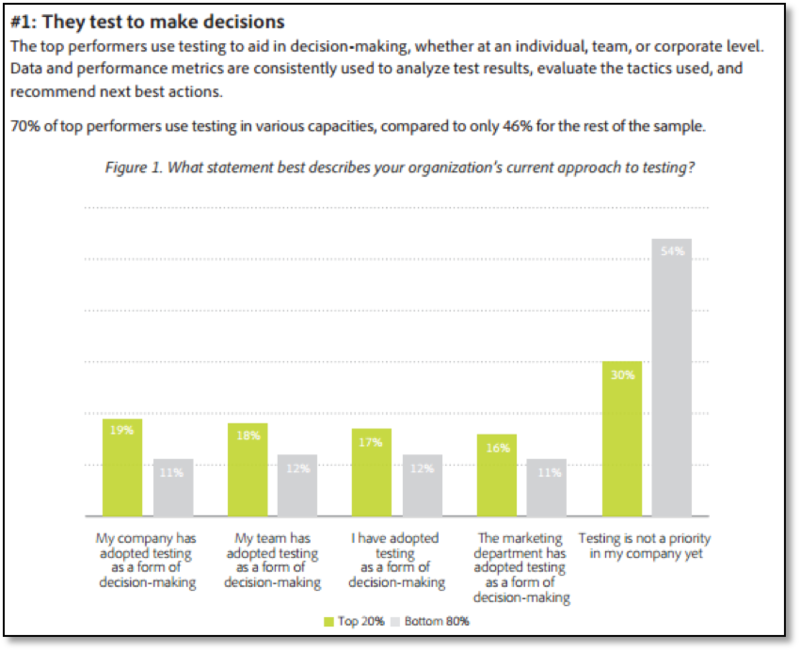 In Adobe’s 2014 Digital Marketing Optimization Survey (read PDF), the #1 lesson learned that separated the top performers was the value put on testing to make decisions. So what should a good testing budget look like? 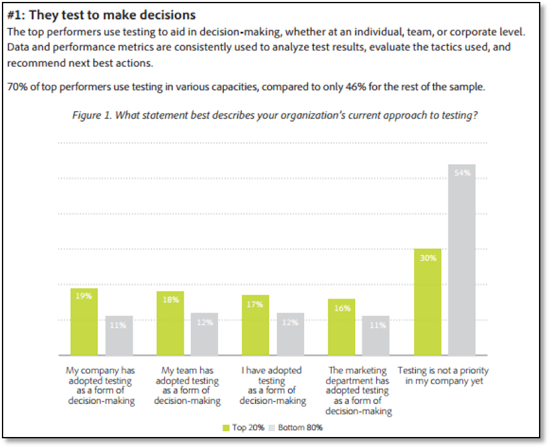 There’s no magic number stating what marketers should devote to testing, because every business model is different and some can afford to take on more risk than others. A good place to start is to take 5-10 percent of an overall budget and devote it to trying new concepts. 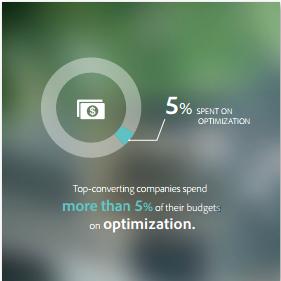 In the Adobe survey above, the top 20 percent were 54 percent more likely to spend over 5 percent on testing/optimization. With all of this said, there must be clear expectations for testing. The CPA goal from a testing budget cannot be the same as goals from tried-and-true campaigns. Work the expectation that not all testing will be successful into overall goals to leave room to stay competitive. About the Author: Jessica Carr joined 3Q Digital in June of 2013. She has worked in SEM since graduating from the University of Wisconsin-Milwaukee in 2009 with a degree in Marketing. She came to 3Q Digital from eSearchVision, where she was a Senior Account Manager. She enjoys spending her spare time with her husband Tyrone and twin girls Sophia and Eliana as well as staying active in sports and her community.